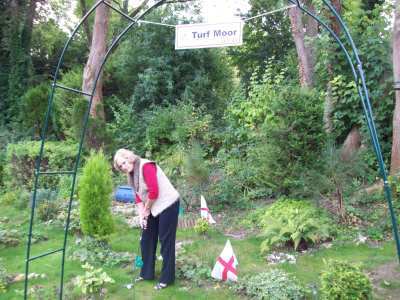 Our fund raising, which culminates in the annual charity day, starts with our February golf day though our Charity Committee meets regularly throughout the year to discuss new ideas. 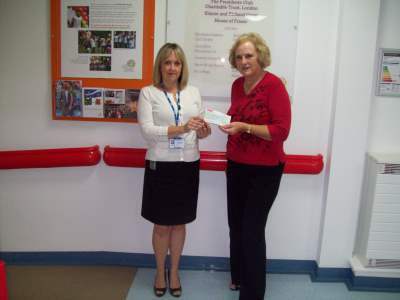 In recent years we have raised between £20,000 and £30,000 each year. The main focus for the fund raising is to donate to the Children's Cancer Unit at The Royal Marsden hospital, with donations being made to other similar charities in particular circumstances. 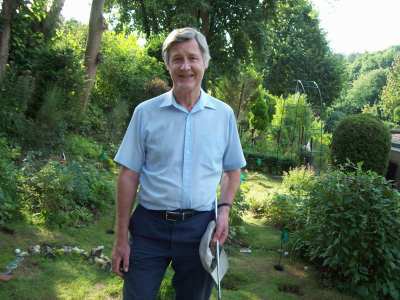 The fund raising activities have been a core activity since 1995 and we are very proud that in the past twenty years the total raised over the years has exceeded £400,000. With increasing longevity, cancer continues to affect many people either directly or indirectly through a loved one. Yet each year more battles are won against this illness and much of this progress is due to the research and treatments developed at The Royal Marsden. Time and again, we hear people express their appreciation for the efforts this organisation has made in supporting the indiviual themselves or their close relatives. Those of us lucky enough to be fit to play in the annual charity golf day and other golf events should be inspired by the work done by our chosen Charity. The BAGS Charity Committee would like to thank everyone who has been involved, including the players, helpers, clubs who have donated vouchers for rounds of golf for auctions and prize, and the many people and organisations who have sponsored events and donated prizes. The committee will continue to ensure future events are enjoyable and successful so those who are less fortunate than ourselves are given direct support to combat and hopefully conquer their illness. See BAGS Fund Raising on the home page. Amy Mullins (Head of Community Fundraising) and Aaron Tillyer (Community Fundraising Executive) receive a cheque for £30,000 from BAGS members Mike Christieson (left) and Hedley Greatbatch (right). This total from fund raising in 2017 is a record for BAGS. 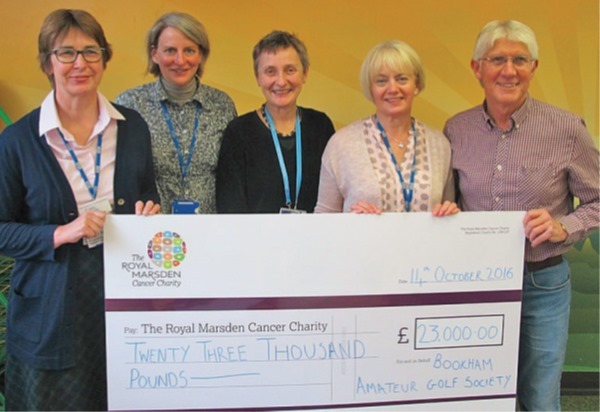 Aaron, from The Royal Marsden Cancer Charity, said: "We are so grateful to Bookham Amateur Golf Society for raising an incredible £30,000 for us, which will help support our Robotic Surgery Fellowship programme. This new programme is the first of its kind in the country, training the next generation of surgeons to use our state-of-the-art surgical robots." Last year we had the opportunity to fund a complete project which was looking at more personalised treatment of a particularly aggressive cancer called Rhabdomyosarcoma. This cancer affects children and adolescents, where the survival rate is poor, and the goal is to improve the outcome for these patients. 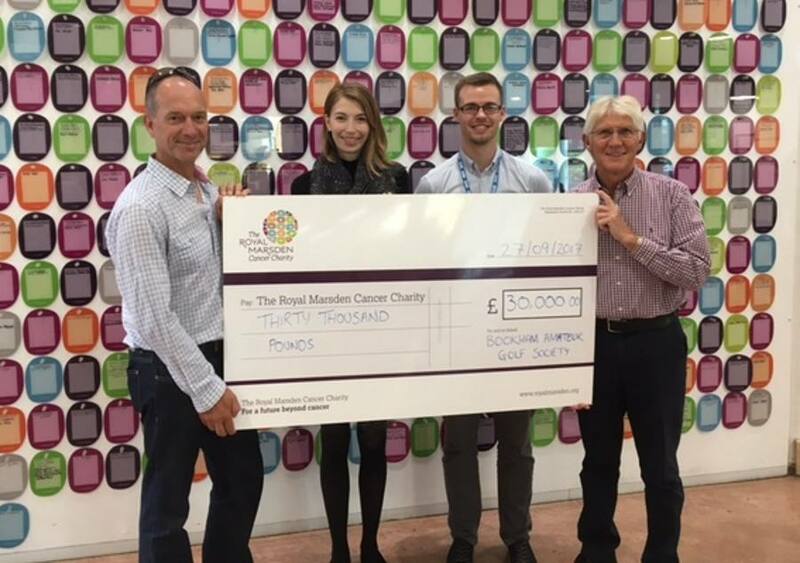 Our record amount of £28,000 last year provided the money to set up new patient derived models by using fresh tumour samples donated by patients at the Royal Marsden, and to date one model is now fully established and 3 more are at various stages of the development process. Over the coming year, the aim is to continue the current development, and to start making one or two additional models, in order to produce new and better treatments for patients. The results will then be part of a shared national and international resource. The Oak Centre for Children and Young People at The Royal Marsden Hospital, Sutton is a state-of-the-art specialist cancer treatment facility where recent advances in technology and internationally forefront research combine for the benefit of their young cancer patients in a comprehensive way. Treatment is tailored to each young patient's specific needs and administered within a family-centred environment where health, educational and social needs are embraced by a strong multidisciplinary team. When the young patients arrive to be admitted, the team have to get them into their rooms as quickly as possible to minimise stress and infection. However, before they can be admitted their rooms have to be 'deep cleaned' to ensure that there is minimal risk of infection from C.diff or MRSA, germs can kill these vulnerable young patients. A deep clean can take 2 - 4 hours or even longer if the cleaning team are busy elsewhere. 120 hospitals in the USA are now using a piece of equipment which can reduce this cleaning time to 10 - 20 minutes and clean to a 99.9% level free of problems. (It even gets into corners and all the little nooks and crannies.) This ensures a quick transition to the ward to the benefit of the patient. This innovative piece of kit is a Clinell UV-360.As you'd expect, this equipment is expensive but its impact on young lives whilst at their lowest is considerable. We are delighted that the proceeds of the 2015 BAGS Romain Royal Marsden Charity Day will help purchase this vital piece of equipment for the Royal Marsden. A letter of thanks has been received from Kamran's Ward in Oxford which benefited from the kind donation of £2000 as part of BAGS fund raising in 2013. The money has helped establish a teenager facility and an outdoor area. 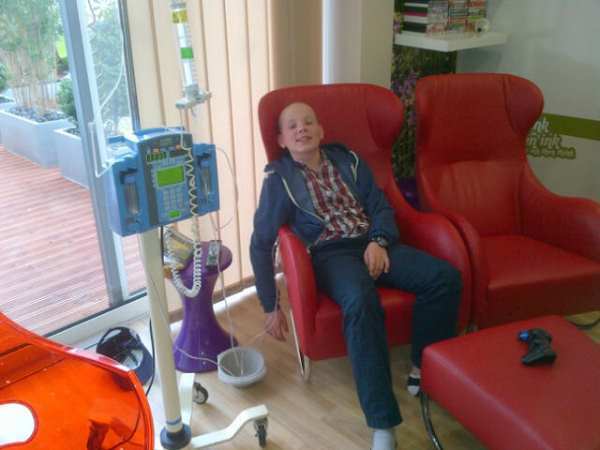 The children in the ward are often there for days or even weeks at a time and because the chemotherapy drugs are very toxic they can not leave the ward for a wander around the hospital or to go outside. The teenager room allows the older children to enjoy an environment which feels more grown up than the rest of the ward and includes an outdoor decking area which was very welcome this summer. The photos below show Peter Marshall making the most of the facilities and beating his Dad at table tennis even while connected to his drip. Chairman Roger Boychuk opened Turf Moor Links with a scintillating round on Friday August 23rd 2013. He will hold that course record because the par of the course has been changed over the weekend to 56 and Andy Harper now holds the course record with a 57. It is a challenging course and a test for any golfer so come along next weekend 30th and 31st August and Sept 1st - all profits to our charity - it takes 20 minutes to play followed by a long chat over a cuppa and super home-made cake or bacon rolls in the 19th cafe run by Chris Little. The project raised a magnificent £1050 from BAGS members and other friends of the Littles and Chris is shown presenting the cheque to Amanda at the Royal Marsden. Chris & Steve wish to thank all those involved for their support in this project. We congratulate them both on this initiative which has provided fun for the participants and valuable funds for the RM. The Opening of the Royal Marsden Centre, 29th September 2011. BAGS included in the list of supporters in the entrance hall.